It was hot during the entirety of our tour through China. And I mean, it was hot. 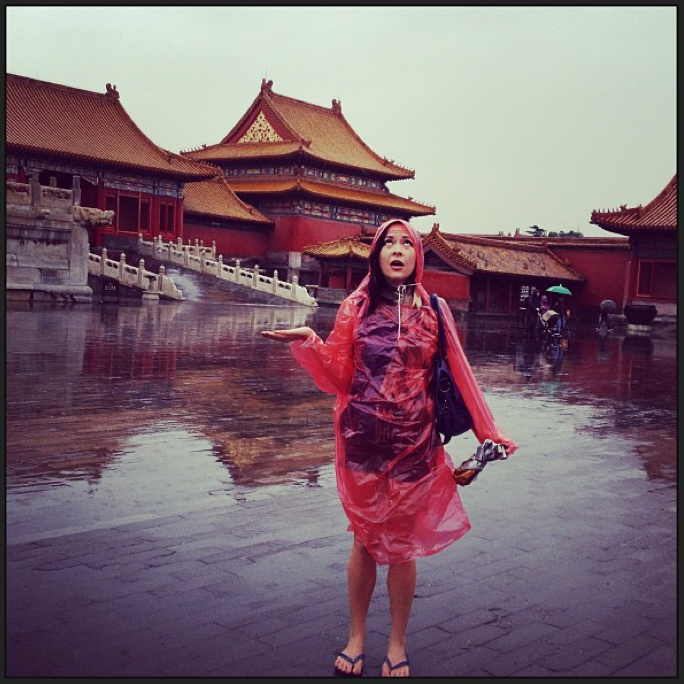 So imagine our surprise when the long-awaited day to visit the Forbidden City arrives, and it was pouring rain. The rain was so heavy we could barely see where we’re going (a nice hiatus from the visually impairing smog), and the wind rendering our umbrellas absolutely useless. And, sadly, that’s just about my only picture because despite the immense rainfall, it was swarming with tourists—most of them Chinese. I know it doesn’t seem so in that picture, but just imagine how many people should be in this shot, then imagine them all huddled into every room behind the velvet ropes, like a fistful of uncooked noodles: compacted, stiff, and ready to snap. In short, there were so many people simultaneously seeking shelter and snapping pictures that it wasn’t worth another battle of the centuries to elbow my way in. This picture sums it up pretty well. Don’t worry, there were plenty of golden finishes on the edges of roofs, statue guardians at many doorways, possessions left behind from the emperors’ mistresses (in their quarters arranged by hierarchy) and many other relics of drama gone but not forgotten.